This page shows the 3D modeling assignment with accompanying videos and resources that may be helpful when creating your model. SketchUp Basics Page - This is a a class lesson page in which you should make a simple house a learn how to use basic tools. This page is representative of one lesson in the computer lab. SketchUp Advanced Skills Page - This page is for the more advanced user and shows videos and techniques that may be helpful in this project and a future project in which you draw your model made in the workshop. Grade 7 ---> Use Google SketchUp to create a simple model of a house. It must have at least three repeating elements to the model, such as windows, doors or garden elements, such as a fence, that have been produced by copying, rather than creating each one individually. Since the dimensions of the model should be realistic, I suggest that you make the model of a place you know well and can measure. The more detail you incorporate, the better the result will be. Printed submissions will receive a maximum mark of Level 1, because they do not take advantage of the computer screen, zooming, scenes and other animations. Drawings must have the measurements included in the drawing. Dominoes with a pattern on the back and indentations for the numbers on the front. A pack of seven dominoes will suffice. Each model has an element of repetition and has detail, if looked at closely. Your model should show the detail and display measurements that accurately refer to the real object. Superior models may contain curved edges and use sophisticated techniques for representing the object. Objects that do not receive prior approval will receive a maximum mark of Level 1. Printed submissions will receive a maximum mark of Level 1, because they do not take advantage of the computer screen, zooming and other animations. The surface area of the faces of 2 of the sides must also be shown. Here is an example of how you can show surface area and dimensional measurements. This stair model would not qualify as a model for this project. It is not sufficiently complicated to meet the expectations. It is included to show how to measure an object. Here is an example of how you can show dimensional measurements of a power bar. This model below, the power bar, would receive a level two. It has simple repetition and only one difficult element. It looks realistic but has no moving parts. Less complete models would receive a level one. In order to receive a level 3 or more, you must have a moving element in your model. To do this, you must use Sketchy Physics. This is a plug-in that allows the objects you make in SketchUp behave like real objects. They move, fall over, roll, and react to gravity in a real-world manner. Here are some links to Youtube videos that show what you can do with Sketchy Physics. Please note that this only works for SketchUp 8, the version we have at school. The company that took over SketchUp does not make version 8 available still. We use version 8 at school and it works with SketchyPhysics. The download link for older versions of SketchUp for the PC is found below. Sometimes, students email questions and receive further instructions to guide them throughout the process. In response to some student inquires, I often provide links to videos or text instructions to help solve problems. Two of these are listed below and may be of some help. 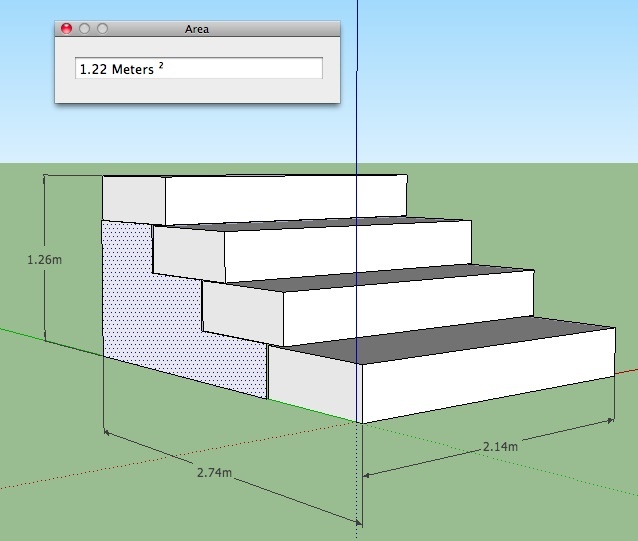 If you have made the stairs into a group, you can easily use the scale tool to shrink the size of the stairs. I have made a video for you to show you how it is done. If you have learned the basic steps easily, you might also wish to learn about some new techniques.